In my opinion, the very best way to mount a pen mandrel shaft on the lathe is to use a collet chuck which ensures that the shaft is held securely and runs true. 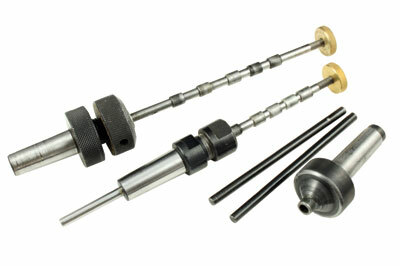 Several manufacturers have now developed mandrels that use the collet chuck principle to retain the shaft and these two products from Penn State Industries are nicely made examples of this genre of mandrel. The Maxi Mandrel has a standard 7mm (9/32in) shaft which slides through a collet which is secured by means of two 22mm (7/8in) wrenches (not supplied). This ensures a firm grip, but care is needed not to over tighten the collet as most 22mm (7/8in) wrenches are quite large and capable of applying much more torque than is required to tighten a collet nut. The advantage, however, is that they are unlikely to get lost in the shavings like Allen keys or small tommy bars. In use the mandrel, which is supplied with five standard bushings, runs true and the adjustable shaft means that the length of mandrel in use is never any longer than necessary, thus reducing the opportunity for whip and loss of concentricity. On loosening the shaft a gentle tap may be needed to free it from the collet, especially if you have been over enthusiastic with the wrenches when tightening. The Keyless Pen Mandrel System has all the features of the Maxi Mandrel with the added advantage that the 'keyless' feature allows you to instantly hand loosen and tighten the collet that secures the mandrel shaft. Two large knurled knobs are provided which enable sufficient force to be applied by hand to tighten the shaft securely, whilst two tightening rods are supplied that engage in holes in the knurled knobs to apply additional torque, if required. As with the Maxi Mandrel five standard bushings are provided and held in place with a knurled brass nut that, like the collet locking knobs, is large enough to be tightened by hand. The Keyless Mandrel System runs accurately and concentrically and as no tools are required to fit and remove or adjust the pen blanks, I found it extremely convenient in operation and a potential time saver for anyone who makes production runs of pens. A further convenience is provided by the Mandrel Saver, a fitting unique to Penn State Industries which does away with the need for a mandrel nut and also, by removing pressure from the tailstock on the end of the mandrel shaft, promises greater accuracy and a reduction in the likelihood of bending of the mandrel shaft and subsequent loss of concentricity. The Mandrel Saver is essentially a revolving centre which has been bored to accept the standard 7mm (9â„32in) mandrel shaft so that the blanks and bushings are retained by bringing up the tailstock quill. I found this to be convenient in use as it facilitates quick removal and replacement of blanks and bushings, but did not find it to be any truer running than the mandrels when used with a normal revolving centre. The bearings on the test sample were a little noisy in operation, but they stood up well to continuous use without overheating or failing. It does also entirely eliminate the problem of worn out revolving centre tips damaged by pen mandrels and vice versa. I found both of the mandrels to be excellent tools which perform their function admirably and the Keyless System provides added convenience if you can justify the additional cost. The Mandrel Saver also does just what it is supposed to but I would have liked a little less bearing noise. Penn State Industries produce an extensive range of products for the woodturner, and I think it fair to say that they have a massive range of products for pen turners. I, like Walter, think that these products work well. I like the Keyless Pen Mandrel System and think the convenience it offers is well worth the extra cost. 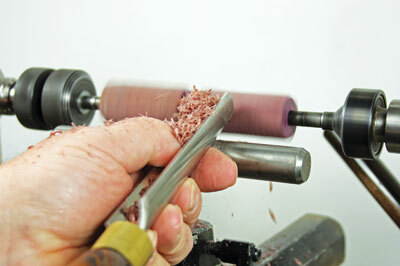 The Mandrel Saver is great. All too often I have lost concentricity on pen mandrels by bending the shafts and this neat piece of kit does indeed stop this. The unit I tried was noisier than the standard 60° revolving centre I have, but like Walter found, it perfomed well and I could not fault it in use. Overall, all the products tested seem to offer very good value for money.